A major deciding factor in where I travel these days? The food - and Iran did not disappoint. The stews, the fresh produce, the yogurt with shallots (seriously, so much yogurt with shallots)! 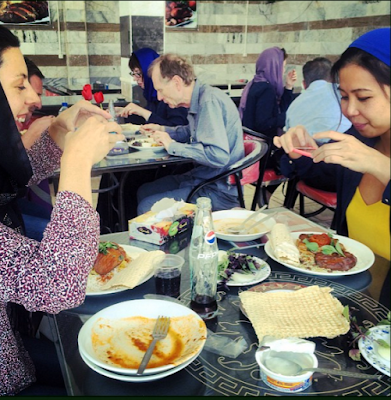 We only got a small taste of what Iranian cooking has to offer - most restaurants have pretty limited menus heavily featuring kebab - but it was clear that Iranians love to eat and know how to bring out the best in their ingredients. If I return to Iran one day, Inshallah, I hope to get a taste of some home cooking, as I hear that's where Iranian food really shines. 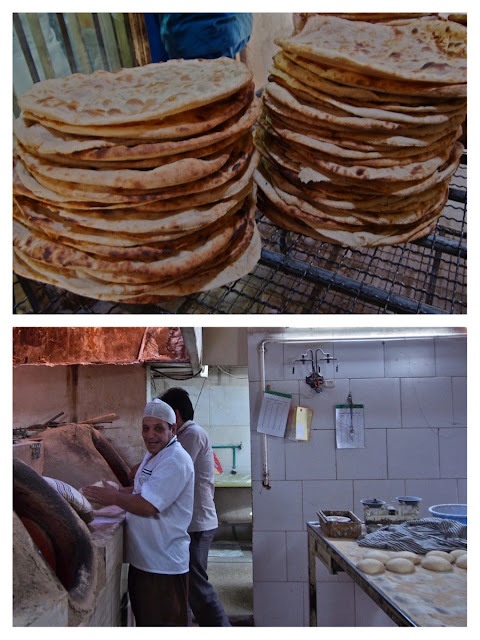 Food in Iran is very driven by what's available locally - it changes by season and by region. Late summer was the perfect time to be in Iran because it was pomegranate season! Ab anar (pomegranate juice) were two of my first words in Farsi. One of my favorite ways to explore a new place is by visiting the markets. Most of these pictures are from the bazaar in Kerman, where 14 foreigners walking around made quite a stir (it's not a major tourist destination). The slightly bewildered vendors were more than happy to pose for pictures with their wares! In Shiraz, there was a night market set up in the park across from our hotel. 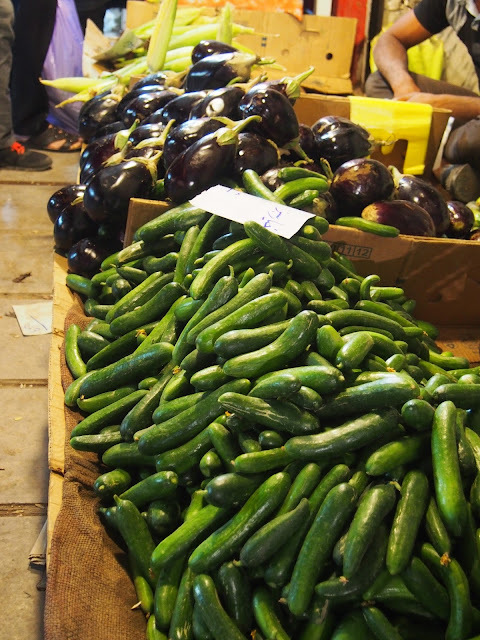 It featured a lot of spices, pickles, olives, and nuts, along with prepared sandwich and soup vendors. A group of us decided to join hundreds of locals in making a picnic dinner of it - we each went off in search of something to share, and then sat on the grass amid all the families, listening to music and trying out the wares (winners: falafel-like sandwiches on soft bread with pickles, and a lentil soup). I also bought some of this gorgeous spice mix in the picture below - I don't know exactly what's in it, but it was too pretty to pass up! Coriander, cumin, paprika, ginger maybe, and... some other stuff? Most Iranian meals come with flat bread for dipping in yogurt, wrapping around kebabs, or sopping up stews. The kind below is crispy yet chewy - the perfect combination. When we came across the bakery in the back streets of old Yazd, we had to grab some for a snack. 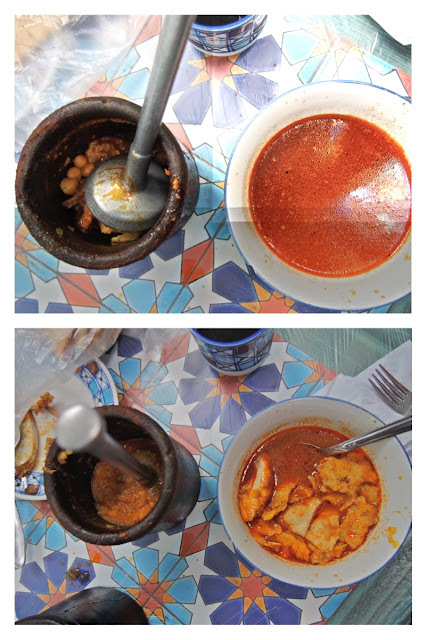 Dizi is a lamb and chickpea stew that involves some work on the part of the diner - they bring you the broth and the stew in separate containers. You smash up the chickpeas and meat, tear up bread into your broth, and then combine them as you go. Stews: I won't lie, I don't know the names of half the things I ate in Iran. A lot of them were in stew form, which was absolutely delicious but not always the prettiest to photograph. Sometimes a little food styling was in order before the photo shoot. Kebab is the most common dish at Iranian restaurants. It's a meal that's harder to make at home, and so people want to eat it when they go out for special occasions. The most traditional form of kebab is minced lamb and beef molded around a skewer; but you will also often find chicken kebab and lamb chop kebab. No matter what kind of meat, kebab is usually served with rice, lemon, raw onion (it's supposed to keep you from getting food poisoning), herbs and often a grilled tomato. Iranian ice cream is really unusual. One of the most common flavors is saffron, and no matter what flavor you choose it's made with a hint of rosewater. Since I can't eat ice cream, I was excited to learn about a frozen treat that the locals in Shiraz are fond of - faloodeh. Faloodeh is tiny, chopped up noodles made of cornstarch, served in a sugary syrup made with rosewater. Most people put lemon juice on top. Judith was a little unsure about the faloodeh - but I quite liked it! I am not a soda drinker at home, but I often had a Coke with lunch while traveling - it's made with real sugar instead of HFCS and I think it tastes so much better. Also, how pretty are the cans? Flavored, non-alcoholic beer - yes, it's as gross as it sounds (at least in my opinion - lots of folks on the tour grew quite fond of it by the end of two weeks!) Tons of flavor options - lemon, pomegranate, peach, tropical... of all of them, I surprisingly thought the plain "malt" flavor was the most palatable. No alcohol in the country means fruit juices dominate the drinking scene. There are the straight-up fruit juices, like the fresh pomegranate and orange juices you buy on the street; and then there are the fancy mock-tail juices with names like Faux-jito and "Sangria". Most of them are pretty delicious, though I think they'd do better not to compare themselves to their boozy relatives... 'cause let's be real, that grape juice did not taste like sangria. A "Faux-jito" (basically mint lemonade slushie) and a celery-lemon juice in Isfahan. I didn't find coffee to be super common in Iran - most people drink tea. But there seems to be a growing cafe culture, especially in trendy parts of large cities. In Isfahan, young people gathered at cozy coffee shops in the Armenian Quarter to talk business, politics, life and love long into the night. On our last day in Tehran, we found a cute cafe run by sweet 20-something hipsters where we drank Turkish coffee and ate one of the most delicious pieces of chocolate cake I've ever had in my life. And of course there was so much tea that I wrote a whole post on it!